Student Passions….do we know what they are? This week I had the opportunity to drive a student from Fort St James to NVSS to catch the bus for Project Resource Management. Contrary to the silent teenager who woke up too early, this young man was eager to tell me about why he had signed up for the Project and how it related to his interests. When I asked him about his current school year, he told me that he was a year behind due to having some trouble with his senior courses, however he said that he and his parents were ok with this as he was going to be able to work at a pace that suited him. 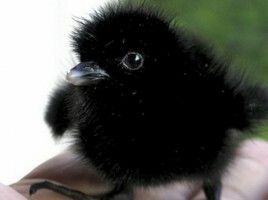 Then he went on to tell me about a recent home project in which he had raised two abandoned baby crows. He had me laughing with the antics of the birds in his house and how he had to observe groups of crows teach their young how to forage. He spoke like a young Farley Mowat in sharing a true Canadian experience. The entire experience reminded me of the times that I have sat on Graduation Transition presentations (something that all teachers should do) and learn something new about a student’s passions and interests outside of school. I’ve always been a little embarrassed to learn this information in the last month of grade 12….why didn’t we find out sooner? I was reminded that we have much to learn from our students and providing them with opportunities to share their passions and learning outside of school are essential to engaging them and other learners who get to hear these stories. In my opinion it is important that we do this often and in a way that helps students determine next steps in developing their passions. We wrapped up the Ed Chats with the final sessions in Fraser Lake and Burns Lake this week. Thanks to all who came out and I encourage all of you to watch for future Ed Chats in your communities as it is these conversations that help us reflect on how we can improve our schools. 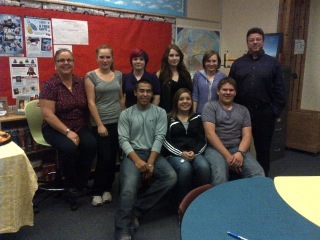 Here is a picture of Lisa and Dan with FLESS students who helped act as table facilitators this past week. I’ve heard that the voices of these students was really appreciated at their table groups…well done! A special ‘Thank You’ to Burns Lake Mayor Luke Strimbold who joined the conversation in Burns Lake. Babine Elementary Secondary…Off to a GREAT START! week and was so impressed with the welcoming students and staff. I had a chance to view some of the film projects that the students have worked on. Just a little foreshadowing, but later this week I will post the BESS news cast which will have you in stitches (just waiting for internet permissions.) Here is a young man that was eager to show me how many Carrier words he knew. All school websites are undergoing changes and here is the new LDSS website….great work Darlene, Ruby, and Mike. Why Fort St James….a video project from Mr. Sundahl and his students from 2011-12. An excellent school – community partnership. Remember to enter the ‘September Question’ challenge and check out the entries from classrooms around the district. Throw that challenge up on your Smartboard and give your students a chance to think about questions that made them think. Speaking of Smartboards, all teachers in SD 91 now have access to a set of smartboard instructional videos HERE (accessable from the SD91 website – Staff Resources.) You can get login information from either your principal or the SmartBoard liaison within your school. The ‘Behaviour Portal’ also went live this week (talk to your principal for more info) and this is exciting as the behaviour portal has direct access to the AMS academic data which will help us to look closer at how student behaviours are correlated to overall school engagement and performance. Had a friend just tell me about the website ‘Wonderopolis‘ which offers a question of the day that will definately intrigue your students. Thanks for the tip Eileen! WE have our second professional development day of the year this coming Friday, Oct. 19.